A Japanese H-2B rocket launched toward the International Space Station on Friday with a fresh set of high-power batteries, critical parts for the research lab’s carbon dioxide scrubber, and several tons of food, water and provisions. The unpiloted HTV cargo carrier on top of the H-2B rocket began a four-day pursuit of the orbiting research lab, making the first leg of its trip into orbit from the Tanegashima Space Center, a launch base off the southern edge of Japan’s main islands. 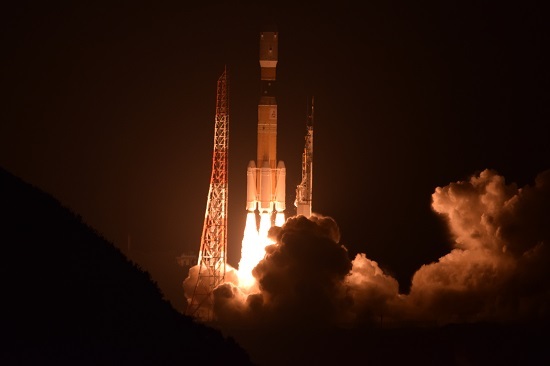 Riding 2.5 million pounds of thrust from two hydrogen-fueled LE-7A main engines and four solid-fueled boosters, the cargo freighter lifted off at 1326:47 GMT (8:26:47 a.m. EST) Friday, heading southeast from Tanegashima to line up with the space station’s flight path. The four solid rocket boosters bolted around the base of the 186-foot-tall (56-meter) rocket split off in pairs around two minutes after liftoff, and the H-2B’s payload fairing jettisoned around three-and-a-half minutes into the mission, exposing the HTV cargo craft once the launcher reached space. 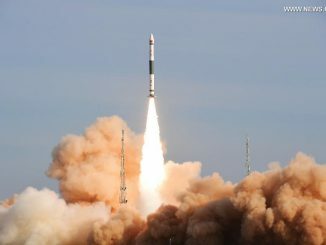 The two LE-7A main engines, followed by the rocket’s upper stage LE-5B powerplant, accelerated the 17.5-ton cargo ship to orbital velocity. The barrel-shaped supply freighter deployed from the H-2B rocket’s upper stage around 15 minutes after launch, traveling over the Pacific Ocean at a speed of approximately 5 miles (8 kilometers) per second. Officials from the Japan Aerospace Exploration Agency — JAXA — declared the launch a success, giving Japanese resupply launches a six-for-six record. The HTV, dubbed Kounotori 6, is packed with around 9,080 pounds (4,119 kilograms) of cargo, equipment and crew provisions, according to NASA. Kounotori is the Japanese word for white stork. Kounotori 6 will fire its thrusters multiple times over the next three days to set up for a final approach to the space station Tuesday, culminating in the grapple of the HTV by the orbiting outpost’s Canadian robotic arm around 1100 GMT (6 a.m. EST). Under the control of space station commander Shane Kimbrough and European Space Agency astronaut Thomas Pesquet, the robot arm will reach out and capture the free-floating logistics ship as it keeps pace about 30 feet, or 10 meters, below the complex. The robot arm will maneuver the HTV to an attachment port on the Earth-facing side of the station’s Harmony module, where it will stay until around Jan. 20. The largest payload aboard Kounotori 6 is a specially-designed pallet holding six lithium-ion batteries destined to replace a portion of the space station’s aging nickel-hydrogen batteries. The new batteries are lighter and more efficient — one lithium-ion unit is capable of replacing two of the old models — and will be installed outside the space station’s right-side S4 power truss, one of the laboratory’s four main solar array modules. Space station managers plan to conduct the battery swap primarily with the lab’s robotic systems, but two spacewalks by astronauts will be required in January to aid in the procedure. The station’s robot arm will pull the pallet containing the new batteries out of the HTV’s unpressurized cargo bay, and a two-armed robotic handyman named Dextre will remove the old batteries from their home on the S4 truss. Two astronauts will head out on two spacewalks to help clean up after the changeout, placing the other three nickel-hydrogen batteries on temporary adapter fixtures and inspecting the work of the Dextre robot. The HTV’s cargo pallet, now holding the disused nickel-hydrogen batteries, is only big enough to receive nine of the old battery boxes. 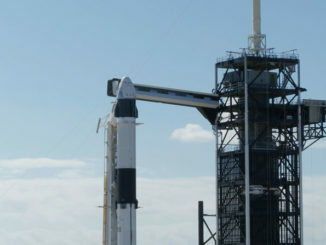 The robot arm will push the pallet back inside the HTV’s external cargo section for disposal at the end of the mission. Eighteen more lithium-ion batteries are scheduled to head for the space station on the next three HTV missions in 2018, 2019 and 2020. The new lithium-ion batteries should operate for at least 10 years — longer than the space station’s planned remaining lifetime. Each new unit weighs about 550 pounds (250 kilograms). 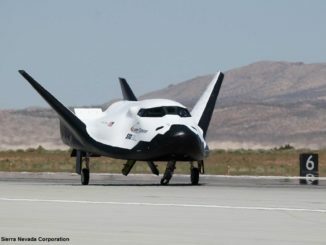 The total mass of the battery package, including the adapter plates, is around 3,013 pounds (1,367 kilograms), a NASA spokesperson said. Meanwhile, astronauts working inside the space station will begin manually unloading the fresh supplies inside the HTV’s internal cabin. The pressurized cargo manifest includes 2,786 pounds (1,264 kilograms) of crew supplies — food, water, clothing and other items — 1,641 pounds (663 kilograms) of vehicle hardware, such as tools and spare parts, 925 pounds (420 kilograms) of research payloads and associated gear, and 343 pounds (156 kilograms) of computer resources. Ground crews also placed inside Kounotori 6 around 77 pounds (35 kilograms) of spacesuit and spacewalk equipment and 62 pounds (28 kilograms) of cargo for the the station’s Russian segment. Among the science hardware is a payload package designed to demonstrate new spacecraft cooling systems, and a dosimeter to measure radiation exposure inside the space station. A high-definition imager, with 4K and 2K cameras, is also aboard Kounotori 6 to eventually be added to an external mount outside Kibo, enabling better nighttime photography. NASA requested that Kounotori 6 deliver fresh hardware for the space station’s carbon dioxide removal assembly, which scrubs carbon dioxide from the air inside the complex. There are 12 CubeSats inside the HTV cargo craft — seven with their launch arranged by JAXA and five by Houston-based NanoRacks — to be ejected into orbit outside the station’s Kibo lab in the coming months. The CubeSats launched through an arrangement with NanoRacks include the 6-pound (3-kilogram) TechEdSat 5 spacecraft, a mission from NASA’s Ames Research Center to test out an “exo-brake” device to slow down and re-enter Earth’s atmosphere. NanoRacks’ allotment also includes four Lemur-2 CubeSats from Spire Global, a San Francisco company with a growing fleet of small satellites to track global shipping traffic and collect commercial weather data. Once the HTV leaves the station Jan. 20, it will spend another week in orbit conducting an experiment that could lay the foundation for a mechanism to remove space junk from orbit. Japanese ground controllers will sever the tether after about a week to keep it from interfering with the HTV’s own destructive re-entry, which will be guided by conventional rocket thrusters in a de-orbit burn. The ship will dispose of several tons of space station waste and the decommissioned nickel-hydrogen batteries.